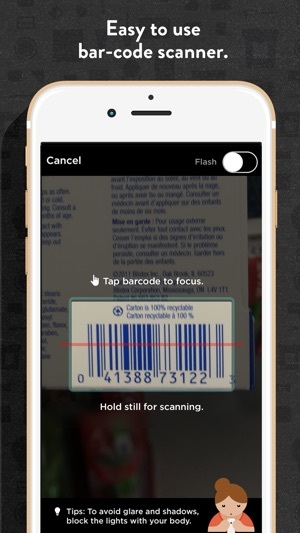 • Barcode Scanning: over 8000,000+ cosmetics and personal care products majority from Canada and the U.S. are currently in our database. • Dirty Meter® a comprehensive rating is given, along with detailed (but easy-to-understand) information on ingredients, certifications, and health impacts. • My Bathroom Rating: keep track of what’s already in your bathroom. Learn your current bathroom rating, and track your progress on “cleaning” it up. • Shopping lists: save products to make shopping faster and easier. • UPC Submission: Are we missing a product? Scan and submit a barcode for us to look into. For registered users who submitted products, we thank you and will notify you once they are in our database. "Tse's quest for greater transparency is personal. Her mother is a breast cancer survivor, so she's sensitive to hidden dangers in the products around us." 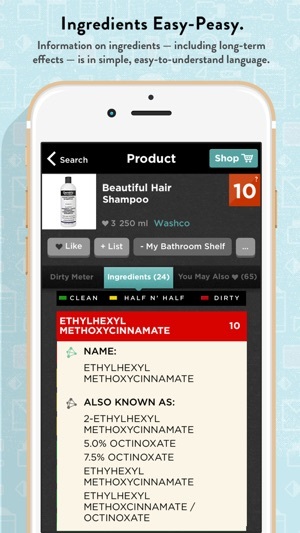 "Brilliant idea: 'Think Dirty' app tells you the ingredients in your cosmetics." 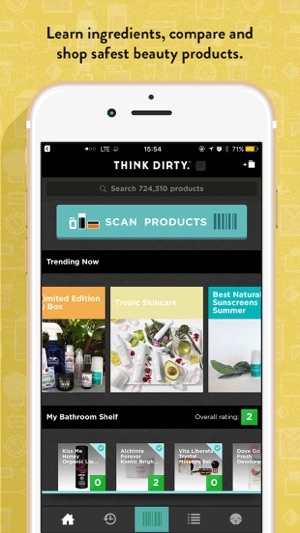 "Think Dirty is an app that makes figuring out exactly what you’re slathering on your face, lips, bod (and, yikes, then washing down the drain) as easy as snapping a picture." "An App That Helps You Find the Safest Make-up." "With a tool like Think Dirty, consumers can help find and promote good companies that are using nontoxic ingredients. You shouldn’t have to be a toxicologist to know how to find safer products." "I love knowing the health impact of what's on my bathroom shelf. 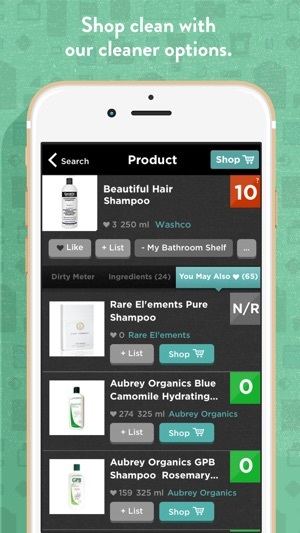 Every consumer of beauty products needs this free app"
As a small team, we are working diligently to accommodate the overwhelmingly positive amount of users' submissions (especially from our international users) to our database. We appreciate constructive feedbacks. Please email us at questions@thinkdirtyapp.com if you have comments or suggestions. Thank you very much for your feedback on the app. We strive to be a wholly unbiased platform for users to gain information about the products they are using or considering as a purchase. We cross-reference ingredient information with lists of prohibited ingredients from government and non-profit health and environmental groups. Due to lack of formal government regulations, most of these lists are guidelines only, but they are backed by scientific studies with abstracts which are available to the public. We take the health impacts of cosmetics seriously, so if there’s enough evidence showing that even a single ingredient is unsafe, it will be listed as “Dirty” on the “Dirty Meter”. The ratings are strictly based on our own interpretation; other sources could have their own opinions. For more information, please tap the Ratings box on the Product screen, or you can also review our Terms of Service. I downloaded this app several years ago. I went on a scanning frenzy. It was both alarming & terrifying to read all the suspect ingredients that were in items I had assumed were for the most part safe, particularly skin care. One expects chemicals in cleaning products, but not your lotion or toothpaste or even laundry detergent. It also made me think about where all these chemicals end up, that is in our water supply & soil, basically they are assimilated into our environment one way or another. That is the real benefit of this app, it makes you stop & think. I have found that some of the rating is misleading & not fully accurate like they are trying to scare people. I do not like the persistent level that they push products on users. It seems to have increased significantly since I first downloaded the app. Also I had a ton of products scanned & submitted that were not in the system & they are all gone now. That is extremely frustrating to me. It takes time to input products. I check back occasionally to see if they have been rated & to find that they are all just gone was pretty crappy. Thank you very much for your feedback on the app. We strive to be a wholly unbiased platform for users to gain information about the products they are using or considering as a purchase. The recommendations shown in app are placed in priority as they have been manually vetted by the Think Dirty team. This means we have completed an in-depth review of each ingredient and deemed them to be safe and non-toxic. These partnerships, which are clearly indicated in-app, help keep our app free. We want to ensure everyone is able to access the information we provide. 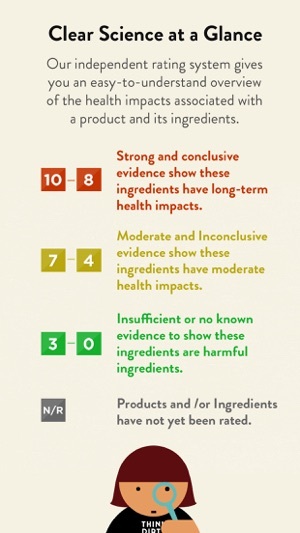 In no way are brands able to have their ratings changed without providing documentation regarding their ingredients being non-toxic. This is a must have app in my opinion. It’s amazing to be able to go through the store in skin products to see which are the least toxic before purchasing them. Marketing gimmick’s make you think “natural” Products are way safer than they are. Think dirty really shines a light on the truth about what’s in our products. I do however think it needs a little work, which is why it got four stars instead of five. Sometimes it will rate things very low such as a zero or a one because the ingredients are not fully in the system yet. So it looks like it’s made of water and aloe vera… When really there’s 10 ingredients missing. I wish that the product was not listed if the full list of ingredients have not been added to the products profile and been properly evaluated and rated. Despite this fact I still think it’s an insanely useful app and everyone should have it. Just use caution when you are looking at a product to purchase because you need to make sure all the ingredients are listed. Thanks for your feedback. We cross-reference ingredient information with lists of prohibited ingredients from government and non-profit health and environmental groups. Due to lack of formal government regulations, most of these lists are guidelines only, but they are backed by scientific studies with abstracts which are available to the public. We take the health impacts of cosmetics seriously, so if there’s enough evidence showing that even a single ingredient is unsafe, it will be listed as “Dirty” on the “Dirty Meter”. The ratings are strictly based on our own interpretation; other sources could have their own opinions. Could you please email us the product which ingredients are missing at questions@thinkdirtyapp.com, we can check those. Thanks again. © All trademarks are registered for Think Dirty Inc.